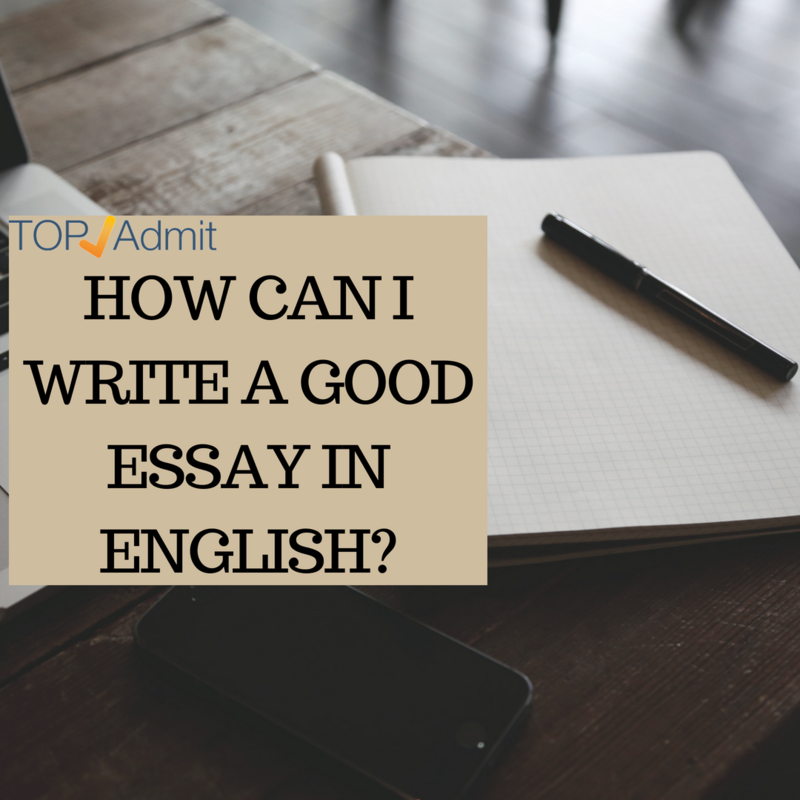 HOW CAN I WRITE A GOOD ESSAY IN ENGLISH? When taking English courses in high school and college, you’ll likely be assigned to write essays. While writing an essay in English may seem overwhelming, it does not have to be. If you give yourself plenty of time to plan out and develop your essay, however, then you will not have to stress about it. 2. Sit down and write. While it’s important to prepare to write, when it comes down to it, you just have to start putting content on the page. Remember that you can always go back and make improvements later, and that revisions are part of the writing process. 3. Draft a tentative thesis. Your thesis is one of the most important elements of your essay. A thesis statement summarizes the main argument or position of your essay in one sentence. It lets readers know what the essay will attempt to show or prove. Everything in your essay should be connected to your thesis in a straightforward way. 4. Develop your introduction. Once you have a compelling thesis statement, craft the rest of your introduction around it. You can also save this step for after you’ve drafted the body of your essay if you feel intimidated by the introduction. The best introductions “grab” the reader’s attention and make them want to keep reading. Some effective strategies for creating an introduction. 5. Jot down an outline for the remainder of your essay. Outlining involves developing a basic structure for your essay, which can help you stay on track while writing drafts. Look over your notes and invention exercises and think about how you can organize this information in an outline. Think about what information should come first, second, third, etc. You can create a numbered outline using a word processor or just put it on paper.Don’t worry about being too detailed when you create your outline. Just try to get the major ideas on paper. 1. Collect all of your notes and materials. Before you start to write, gather together all of the notes, books, and other materials that you will need to reference in order to answer the essay prompt effectively. Support is essential for an effective English essay, so do not try to write your essay without these materials. If you have time, read through your notes before you begin.Make sure that you have your outline handy as well. You can build on your outline by expanding on each of the points in the order that they are listed in. 3. Develop your ideas as much as possible. Make sure that you include as many details as possible throughout your essay. Remember that padding (filling in with meaningless text or using extra wordy sentences) is not an effective strategy for writing essays because instructors can see right through it. Your instructor has probably read hundreds of student essays over their career, so they’ll know when an essay has been padded. Fill your essays with details that make your essay useful and insightful instead. If you get stuck, some good strategies for developing your ideas include:Returning to the invention stage. This includes exercises such as freewriting, listing, or clustering. You can also revisit your notes and books to see if there’s anything you missed or forgot.Visiting your school’s writing lab. You can find a writing lab on most college campuses. They are free to students and can help you improve your writing at any stage in the writing process.Talking to your instructor. Take advantage of your professor’s office hours or one-on-one appointments. Meet with them and discuss ways that you can improve your essay before you hand it in. 4. Cite sourcing using MLA style. If you use any sources at all in your essay, then you will need to cite them using the style that your instructor prefers. MLA style is the most common citation format used in English courses, so you will need to know how to use it. Provide in-text citations as well as a works cited page at the MLA style works cited page starts on a new page at the end of the essay. Provide entries for each of the sources that you used. These entries should include the information necessary to allow the reader to find the source with ease. MLA style in-text (also called parenthetical) citations provide readers with the author’s last name the page number for the information. It’s necessary to include an in-text citation for any information that you quote, summarize, or paraphrase from a source. It comes right after the sourced information, and it includes the author’s last name and page number in parentheses. 1. Give yourself plenty of time. Leaving your essay to the last minute is not a good idea. Try to allow yourself at least a couple of days to revise your work. It is important to take a one to two day break from your essay after you have completed it. Then you can come back to it and revise with a fresh perspective. Focus on improving the content of your essay first. Some people only focus on the grammar and punctuation when revising an essay, but this is less important than the content of your essay. Answer the essay question in as much detail as possible. Reread the essay question or assignment guidelines and ask: Have I answered the question in a satisfactory way?Do I have a clear thesis? Is my thesis the focus of my essay?Do I include adequate support for my argument? Is there anything else I could add?Is there a logic to my essay? Does one idea follow the next? If not, how might I improve the logic of my essay? 2. Ask a friend to read your essay.Having a friend or classmate take a look at your work can be helpful as well. Someone else may catch simple errors or notice something else that you missed because you have been looking at the document so much. Try swapping essays with a friend from class. You can read and comment on each other’s essays to make sure that both of you have done the best work possible.Make sure that you swap papers at least one day before the paper is due so that you will have time to correct any errors that your friend finds. 1. Analyze the topic or essay question.Take time to read over the essay question or guidelines and think about what the assignment is asking you to do. You should underline any keywords such as describe, compare, contrast, explain, argue, or propose. You should also underline any central themes or ideas that the assignment asks you to discuss such as freedom, family, defeat, love, etc. Always ask your professor if you don’t understand the assignment. It’s important to have a clear idea of what they want before you start working on the assignment. 3. Think about what you will need to include. After considering your instructor’s expectations, take some time to think about how you can accomplish these broad goals. Consider what you will need to include in your essay.For example, if you are tasked with writing about a character in a book, then you will need to provide lots of details about that character. This will probably require rereading some passages of your book as well as revisiting your notes from class. To ensure that your paper is easy to follow, you’ll need to make sure that there’s a logical order to your essay. Do this by creating an outline and checking your work for logic.Start early and give yourself lots of time for revision. Try to complete your first draft about one week before the paper is due. 4. Develop your ideas. Invention exercises can help you to draw out details that you already know, which can give you a great jump start on writing your essay. Some useful invention exercises include: Freewriting. Write as much as you can without stopping. If you can’t think of anything, write “I can’t think of anything to write,” until something comes to mind. After you finish, go over what’ve written and underline or highlight any useful information for your essay.Listing. Make a list of all of the details and information that are relevant to the essay prompt. After you have listed everything that you can think of, read over it and circle the most important information for your essay.Clustering. Write your topic in the middle of the page, then branch out with other connected ideas. Circle the ideas and connect them to the main one with lines. Keep going until you can’t do any more. 5. Research your topic if necessary. If you have been asked to conduct research for your paper, then you will want to do this before you begin drafting as well. Use your library’s databases and other resources to find the best information possible for your paper.